All our cities metropolitan and regional are essential economic engines that are already coming under pressure to compete for jobs, investment and talent. Australia is falling behind in key competitive metrics and faces a growing challenge. Based on the recently released whitepaper - A new world of cities and the future of Australia - and Geof's IoT Alliance and consulting experience, this talk will focus on what a city need to do to become a learning, smarter and more future proof city leveraging a digital city platform model. Also taking a look at some of the metrics used to determine if our cities are on the right track in a globally competition for liveability, sustainability, personalisation, jobs, innovation and GDP growth. 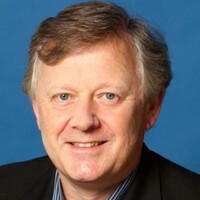 Geof is principal consultant to the Internet of Things Alliance Australia. Strategy and Business Planning work for major Asia Pacific carriers and service providers, engaging at the executive and senior management levels of client organisations. Internet of Things co-founding the IoT Alliance Australia (IoTAA) and an executive Council member of IoTAA. Co-authoring papers 1. Enabling the Internet of Things for Australia, 2. Seizing the Internet of Things opportunity for Australia and 3. Australian Industrial Internet of Things Capability Mapping Report for Austrade. Strategic Marketing and Market Positioning for broadband technologies and Science led innovation in the digital domain. Smart Cities initiatives with Nokia and their Collaboration and Innovation program, ngConnect including co-authoring a paper A New World of Cities and the Future of Australia and running workshops on a range of IoT focus areas including Transport, Agriculture, city infrastructure and energy management.